Somalia is in transition. Over the past year, the Horn of Africa's most troubled state has seen significant progress; with the 2012 Somali presidential election among the most notable developments. After two decades without a stable government, Somalis witnessed open campaigning and were able to cast their vote in what was an important step in taking the future of Somalia into their own hands. As fairplanet reported previously, these recent developments within the country may be seen as a sort of "Somali Spring". Whether one agrees or not, the landmark election of 2012, important victories in the fight against al-Shabaab, as well as the decline in pirate activity, are burgeoning signs for what could be a viable Somali future. The ever-growing Somali diaspora around the world seems to share this belief. Never have so many people returned home - both first and second generation Somalis - with flights to the capital now often booked out well in advance. Things are also changing on the political landscape. For the first time in years, the United Kingdom has appointed a British Ambassador to Somalia. Ambassador Matt Baugh has been working on Somalia since 2010 and was accredited as Ambassador to Somalia in February 2012. He was kind enough to answer some of our questions. Mr. Ambassador, Somalia has long been referred to as a “failed state” and one of the most dangerous regions in the world. In 2012, you became the first British Ambassador to Somalia in 21 years. What kind of challenges did this pose? It is an enormous privilege to have been appointed the UK’s first Ambassador to Somalia in 21 years; honestly – I keep pinching myself. This is the sort of opportunity that diplomats dream of – the chance to really make a difference in a country that really matters. It’s a huge honour to be able to contribute to the forging of a new partnership with Somalia, one that is for the long-term. I guess one of the challenges of being appointed Ambassador was to ensure that our mission - to help support a Somalia that is increasingly stable, where the basic needs of its population can be met, and that is able to begin to rebuild its economy and its future – was understood. I have, however, been struck by the warmth of the reception I have received – and continue to receive – as I travel around Somalia. This has made bearing the challenges easier – and has shown to me that the ties that bind the UK and Somalia together remain strong. Over the last year Somalia has witnessed some major changes; for example the landmark 2012 election, important progress in the fight against the militant al-Shabaab, and rising house prices in the capital Mogadishu. How would you assess these changes? Would you say that these developments represent burgeoning green-shoots for a viable Somali future? On my first visit to Mogadishu three years ago, the situation was markedly different from what we see today – Mogadishu then was a city that felt under siege. Today, thanks to the outstanding and courageous efforts of the Somali forces, working closely with AMISOM, and the bravery of the many Somalis that are returning to Mogadishu, life is breathing back into the city – people are reclaiming their homes; reopening their businesses, reconstructing offices. There is a palpable sense of optimism. 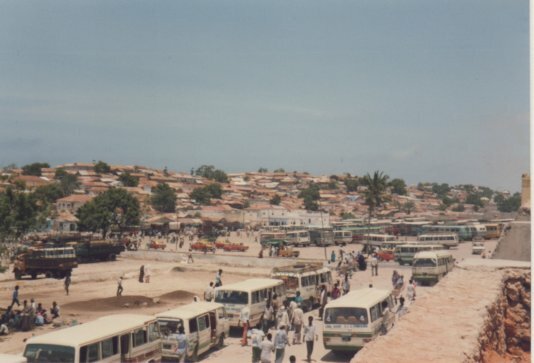 That’s not to ignore or diminish the real challenges that remain, not least making people feel safer on the streets and in their homes; creating jobs for men and women, getting children into school, ensuring that citizens have access to food, water and healthcare – but Mogadishu looks and feels a different place. Two things stand out in my mind: I recall the huge wave of support that greeted the send-off I and then-Prime Minister Abdiweli gave the Somali Olympic Team last year shortly before the London Olympics – it was magnificent; to see so many Somalis rallying behind their national team. And to see the Somali flag in the Olympic stadium in London was one of the proudest moments of my time here. None of this would have been possible without greater security in the city and the political progress made by Somalia’s leaders. Earlier this week, I met the wonderful Ahmed Jama - Mogadishu’s master-chef - in Mogadishu. Not only did I have one of the best meals I’ve had in a long time, I also got the chance to listen to his passion and commitment to help rebuild Mogadishu – his restaurants now successfully employ 150 people. It was inspiring to hear why he decided to return to Mogadishu from London; it was also amazing as we worked out we used to live very close to each other in Hammersmith; in fact he was the chef in my local restaurant, not far from my old home. Another demonstration that the connections between the UK and Somalia run deep! In connection to these ongoing changes - especially as far as peace and security are concerned - would you say that the move of your mission’s offices from Kenya to Somalia is a genuine possibility for the near future? Absolutely. It’s a sign not only of our commitment to Somalia and its people, but also of the changes that are happening in Mogadishu and across the country. We want to be in Mogadishu and in Somalia – working hand in hand with the new Government and the Somali people. We simply cannot do this from Nairobi. We will re-open our embassy in Mogadishu later this year and construction has already commenced. How difficult is it to not be based in the country to which you lead the diplomatic mission? I and my colleagues already spend an increasing amount of our time in Somalia. In fact we already have staff permanently based at our current office in Mogadishu. And we also have a small office in Hargeisa which serves as a base for visiting staff. As we move forward, the UK will continue to increase and expand our engagement across Somalia. I’m really excited about opening our Embassy in Mogadishu; and it’s a huge privilege to be leading the UK effort and working with an outstanding and talented group of colleagues from across the British Government. While conditions within Somalia are slowly improving, there has been news of a series of worrying incidents in the Somali-dominated Eastleigh district in Nairobi, Kenya. Many people speak of a rise in xenophobia against Somalis in Kenya. With your office being based in Nairobi, can you tell us more about what is happening there? Since Kenya’s military intervention in Somalia, we have seen a rise in attacks in Kenya, particularly in the Eastleigh district of Nairobi. While these attacks have a range of causes (including criminality and local conflicts) it is clear that there is a significant terrorist threat against Kenya. We are working with the Kenyan authorities to help them counter this threat, whilst ensuring that their security responses to these kinds of incidents are proportionate and with full respect for the rule of law and human rights. We recognise that these incidents have also begun to fuel tensions between different ethnic groups in Kenya and encourage all parties to work together peacefully to tackle this shared threat. As the first British Ambassador to Somalia in two decades, what is it that characterizes the role and the UK government’s longer-term objectives? Looking forward to the second “London Somalia Conference” in March 2013, what are your hopes for the future as far as British-Somali relations go? We are seeing some significant political and security developments across Somalia – changes that offer greater opportunities for long-term stability than those seen in two decades; changes that have been led by Somalis themselves, with the support of international partners, such as the UK. Firstly, the new government and Parliament both possess greater sovereignty and legitimacy. Secondly, Al Shabaab is being squeezed territorially and is weakened as a result, having lost the strategic locations of Mogadishu, Baidoa and Kismayo. Seizing these opportunities will depend on the decisions taken, predominantly, by the new Somali leadership. But our approach – and that of other partners – will also play a significant role. Our objective therefore is no different from the demands that ordinary Somalis and its new Government are making – to partner with Somalia to help build a country that is stable, at peace with itself and its neighbours; where women and children are safe to walk the streets; where people can reclaim their lives, communities and businesses. None of this is possible without focusing on security, justice and strengthening state institutions – ensuring that ultimately, the Somali authorities are able to provide security for their citizens. This is why President Hassan Sheikh Mohamud and Prime Minister Cameron will co-chair the Somalia Conference in the UK on 7th May – demonstrating that there is an opportunity in Somalia the likes of which we have not seen in a generation; that we have the opportunity to support the emergence of a new, stable Somalia with credible and legitimate leadership; but that this cannot be done without the strong, sustained and coherent support of Somalia’s friends and partners – including now, and for the long-term, the UK. Mr. Ambassador, thank you very much for your time! Gender equality means many things to different people. A research initiative is now putting men picture and changes the debate architecture. Kenya in motion: Today, the reigning President Uhuru Kenyatta will fight against his perennial rival Raila Odinga for the power over the country.